Doris Davis Mobbs of Lawrenceburg, TN, recently of Florence, AL, died in Lawrenceburg on Sunday, August 19, 2018. She passed peacefully with her family at her side after a long struggle with dementia. She was 93. A lifelong resident of North Alabama and Middle Tennessee, Mrs. Mobbs was born in Wayne County, TN on February 3, 1925, to the late Marshall Hall Davis and Pearl Phillips Davis. She later moved to Lawrence County, TN where she graduated from Lawrence County High School and met her future husband, Hershel Leon Mobbs. They married in 1943 and remained so for 70 years until Mr. Mobbs' death. 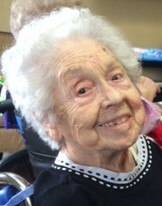 In 1950 Mrs. Mobbs moved with her husband and infant son to Florence, AL, where she lived the next 61 years. Throughout that time she was a member of the First Baptist Church of Florence, where she served as a Sunday school teacher and was active in the Woman's Missionary Union. She worked at various times for Sears Roebuck and Havatampa in Florence but always preferred her higher duties as mother and homemaker. Mrs. Mobbs loved Florence and the many lifelong friends she had there. All whose lives she touched remember her for her beautiful smile, her kind, sweet personality, and her loyal devotion to her friends and family. Mrs. Mobbs is survived by her son Michael Mobbs (Eugenia) of Washington, DC; two sisters: Margaret Morris (John, deceased) and Judith Hutton (George) of Lawrenceburg, TN; six grandchildren: Major (USA) Michael Mobbs, Jr. (Meaghan) of West Point, NY, Clifton Mobbs of Phoenix, AZ, Ellene Moore (Andrew) of Ft. Lauderdale, FL, Solana Sorokina-Mobbs, Estrella Sorokina-Mobbs and Victor Sorokin-Mobbs of Washington, DC; three great-grandchildren: Mairin and Madison Mobbs of West Point, NY, and Ella Moore of Ft. Lauderdale, FL; and many beloved nieces, nephews, brothers-and sisters-in-law, who were with her to the end. Visitation will be on Wednesday, August 22, 2018 from 12 noon to 1 pm at Neal Funeral Home, 231 N Military AV, Lawrenceburg, followed by services at 1 pm in the same location, Rev. Jeff Vanlandingham officiating. Interment will be at Lawrence County Memorial Gardens. Pallbearers will be Michael Mobbs, Clifton Mobbs, John Land, Bobby Jones, Lee Mashburn, and Andrew Fisher. In lieu of flowers, the family suggests donations in memory of Mrs. Mobbs to the First Baptist Church of Florence, AL, the First Baptist Church of Lawrenceburg, TN, or any dementia or Alzheimer's charity.